As an RN I found it to be an absolute fantastic training. I believe that it is very informative and universally appealing (and helpful) to both medical professionals as well as the standard lay person. As the mother of a food allergic child with asthma, I want everyone that is ever in contact with my daughter to complete this course. 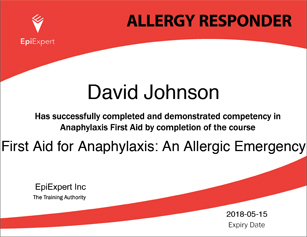 I would feel that anyone that finished this training would be well positioned to know exactly what to do in case of an anaphylactic emergency... You have yourself an exceptional product, and I will be recommending it to anyone in need. Thank you for providing an exceptional course about anaphylaxis management. This course WILL SAVE LIVES!… Considering I am an RN, who has managed ICU, ER and Critical Care-I didn’t expect to “learn” anything. Rather, I thought I would use this course to teach those who care for my daughter. Well, I am 100% positive that my own daughter is more safe today because I took this course. My husband, who is a physician, is also eager to become S.A.V.E Certified. I'm excited to be able to share your training program with family, friends, and the staff at my son's school. I found the information to be easily understood and helpful. No one who finishes this training can walk away without feeling more empowered to use an EpiPen. It is so important that everyone around a food allergic person be confident in that decision and this program really shows how the EpiPen is the only solution for anaphylaxis. Even after 7 years of living with a food allergic child I feel more prepared after completing your training. Thank you for providing me with another tool to keep my son and others like him safe. This course should be mandatory with every epinephrine prescription, or at least suggested with each. Your course is clear and accessible for all attention spans. I applaud the careful thought taken for these educational modules. I am so grateful to your company for creating this, and will be purchasing one for my husband and as many as we can afford for our daycare providers. Get training for your employees or family and friends. Reduce the risks at work by empowering everyone. You can save a life, or stand by helpless during an allergic emergency. Our online course trains you to recognize an emergency and respond. Help others by giving them the gift of training.